Depending on what garment you choose, the logo can be positioned in a choice of locations including chest, sleeve, back or trouser pocket. Workwear embroidery enhances dull and carbon copy work clothes, providing you with a professional uniform that is consistent with your branding. Work with Alsico to produce adept and efficient work uniforms for your business. Customise your new garments so employees can wear the business name proudly and promote unity as a team. Embroidery threads, available in a wide choice of colours including metallics, can be embroidered directly onto the garment or supplied on fabric backing for easy removal and re-use. 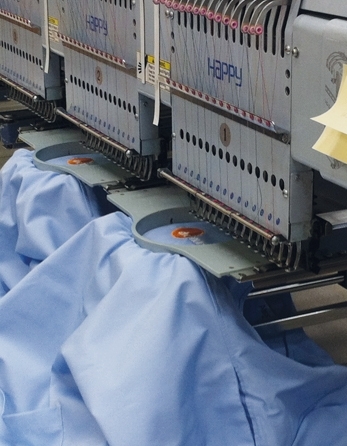 Our advanced workwear embroidery machines can produce intricate stitch work in different colours for greater detail. With new technology making it now possible to embroider on garments such as high visibility garments and waterproof jackets. FR garments requiring embroidery are sewn in Nomex FR thread. Supplied on a white or coloured fabric background and can be ironed or sewn onto the garment. FR badges are also available for FR garments. Call 01772 662500 or email customer.service@alsico.co.uk to find our more information about our personalised workwear service.